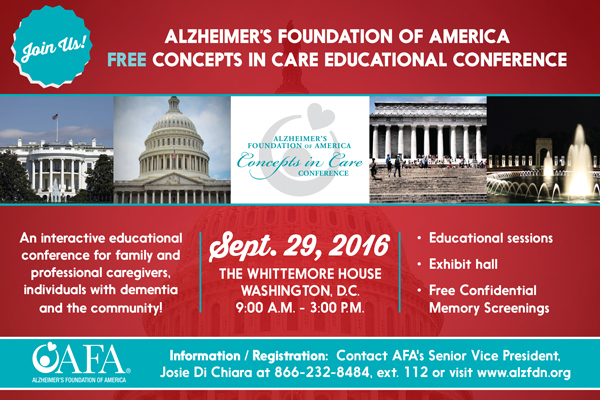 The Alzheimer’s Foundation of America (AFA)’s annual free, educational conference - AFA Concepts in Care - will come to the Whittemore House in Washington, DC on September 29. Designed for both family and professional caregivers, this event will feature educational presentations on a variety of topics pertaining to dementia and caregiving, including an overview of the disease and updates in research, critical and palliative care for older adults, and caregiver abuse. There will also be a panel of caregivers discussing what it’s like to care for a loved one with Alzheimer’s disease. Recreational therapies for individuals with Alzheimer’s disease and related illnesses will be provided on-site. There will also be an exhibit hall and free, confidential memory screenings. Attend: Visit http://www.alzfdn.org/registration/concepts-in-care-educational-conference-washington-d-c/ to register.